It may be a challenge to differentiate your new company file from the old file especially when you just restored a new version. Below are your options to ensure that you can set these files apart. By renaming, you can easily determine which file you're in. To locate your company file, press F2 while logged in to open the Product Information window. Take note of the location and follow the path to find your file. Right-click the company file, then select Rename. Enter a new file name or edit the current one. When you open QuickBooks and see the No Company Open window up with the list of your company files, this is a shortcut. Note: If you renamed your file or changed its location, you will no longer be able to access the company from this list as the link is already severed. If you don't have the QuickBooks window open, hold down the CTRL key (Command for Mac) while opening QuickBooks. On the No Company Open window, select Edit List. Put a checkmark next to your old file(s). 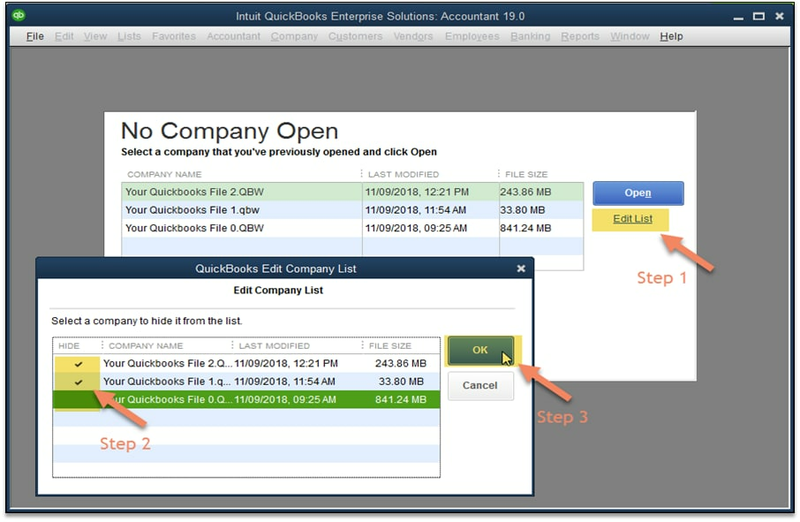 Note: This action will not delete your file; it only removes the shortcut from the QuickBooks window.